This is 5 x 7″ acrylic on damp 300 lb. Arches cold press watercolor paper. I thought it looked pretty cool, so I’ve left it alone so far. What do you all think? Should I add to it, or as The Beatles say, Let it Be? I want to say that I am in LOVE with the vibrancy I get from acrylic paint on damp watercolor paper! 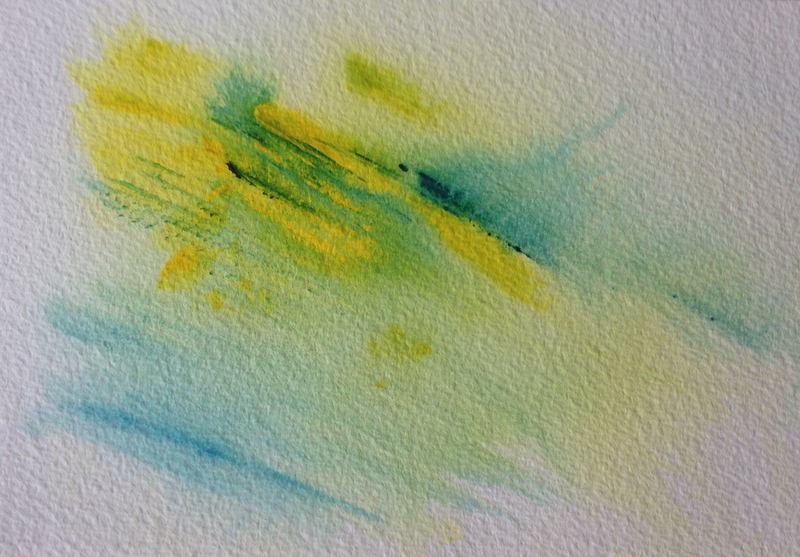 I had a long talk with a technician at Golden Artist Colors yesterday, and she advised that as long as the fluid paints are not diluted by more than half (so you’d want a 1:1 ratio of paint to water, and no less than that), the fibers of the watercolor paper should hold the acrylic paint without a problem. However, if you’re concerned about the viability of the painting, you can always spray an acrylic fixative on top, or even coat the painting with a gloss or matte (depending on the look you’re going for) polymer medium. News you can use for this Tuesday! Peace and paint puddles to all. I love to see your color early in the morning, Laura. Have a beautiful day. Thank you, Sharon and the same to you my friend! Love it! I’m so trying that, Laura. Catherine, I hope you do! So glad you love it! OOOO! I say Let it Be – Let it Be – Let it Be – Let it Be…. 🙂 It is so beautiful in its simplicity – love those colors together. Thanks for creating magic and sharing what you learn with us! Thanks, Jodi! Glad you like it. Isn’t it funny how something you made just to use the paint in a few seconds can sometimes be better at some level than something you put hours into (like the painting I posted yesterday)?? Lots of white space is good. I really need to learn that I don’t need to fill up the paper. Glad you enjoyed and thanks for the encouragement as always! I’m already thinking of what to add to it…….hehe. Dying to abstract Debi’s last photo! What a stunner that was. I will resist adding to this one for now. It needs water and maybe a tree but I’m sure to throw a bad wrench in. Esp if I try the tree. Maybe in pencil. Bah. I will abstain!! I always have the tendency to fill up that white space, it is a hard one to juggle…..a part of me tells you to do something more and yet, it feels just right as it is. Maybe Debi will have something to say…..Debi?!!! I was wondering what you and Debi would say to this! Thank you for your comment, Margaret. I am already tempted to add more. I will try to resist. I was just happy at what the acrylic gods left in my palette and also glad I had a small piece of WC paper near to hand to go and swipe it on. It wouldn’t have been nearly as cool on dry paper, I don’t think. I do love painting with acrylic on WC paper! Have you tried this? No I haven’t but I need to now! I do have irridensent copper, I bet that would look lovely! It would!!! Oh, how I am loving copper and bronze in the acrylics. Wonderful idea! do you have a bunch of old matts around, in various sizes and Shapes?!! Um no. lol. I just found art less than 2 yrs ago but I do think circle would be good for this! And maybe like Charlie said, I could do a series. Would be cool. All with circles! One of my clients/friends is a framer. I will check with them and see if they can do it. They will be able to help with the cropping too as they are art collectors. They run circles around me with their art knowledge. I will look into this! Bless you. Yes! Me too!! Oh that makes great sense. Thank you!! Looks like summertime to me, Laura. Thanks, Michael. Tempted to add more to it! Love the colors, Laura, but since you’re already commenting you want to add more, I’m anxious to see that! I’m very tempted Donna! Thanks for weighing in. It does look really cool Laura! I do like the lightness and summery look about it. Thanks, Susan! Have you ever tried acrylics on watercolor paper? Not yet, Jill, but the technician at Golden advised me yesterday that the matte will change the appearance of anything beneath it so I guess it makes sense what you read about the fixative too. I think gloss is probably your best bet to maintain the color. I think there is marble dust in the matte medium. Or something that makes it cloudy. I know they put marble dust in something but I may be getting the matte med mixed up with something else. As long as it is marble dust and not fairy dust, then I’d be worried…lol! 😉 I need to play with it but I keep forgetting… will let you know how it goes! Thanks Laura! I always amazed how you achieve so much beautiful and interest is your abstracts. This is no exception. Beautiful! 😍I’d say let it be! I love the simplicity and if you did four of these in a grid it would look super cool! Great idea! Thanks my amazing bro! I keep seeing the ocean under a sky like this. Thanks Kerfe. Laura, I’m envious of your ability to try new things and create learning opportunities with different types of media, including “leftovers.” You’re a great inspiration to keep moving forward! I’d say let it be and just hang it it looks totally finished and beautiful! Let it be – it’s a quiet design, not too harsh or bold, and the simple diagonal lines add dimension and interest. Awesome feel to this abstract. Aww, thanks so much Mary. You’re very kind. I haven’t messed with it yet! I may be able to rein myself in. I really need to learn to leave more white on my paper/canvas. Your are following your instinct and the results are standing on their own. I’m really enjoying your experimenting series with the acrylics. Thanks for all the information too – I’ve filed much away for later, mine have been put away for a while as I work on the oil pastels for the time being. Of course! And thank you again, friend. Glad you’re finding it helpful! The acrylics will be there when you’re ready to take them up again. Your art supplies must get so happy when you approach them! You make them do beautiful things! love the simplicity, the summery light FEEL to this!